PDF2Office Personal is a PDF to Microsoft® Word conversion tool for the Mac. Simply drag and drop a PDF onto Word and have it open in Microsoft Word. 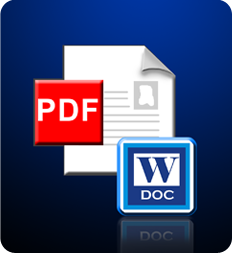 PDF2Office Personal converts the PDF document to Microsoft Word format within seconds. PDF2Office Personal uses standard Microsoft Word interface for opening a PDF document – there is no need to learn anything new. PDF2Office Personal seamlessly integrates with Microsoft Word and the desktop interface. Convert PDF to Word files. PDF2Office forms paragraphs; applies styles; regroups independent graphics elements; extracts images; creates tables; processes headers/footers; endnotes/footnotes and columns/sections, all automatically – without any intervention. PDF2Office allows you to recover the contents stored in PDF documents making it available for use by the most popular software titles. Since PDF2Office is a standalone tool, it is not necessary to acquire and install additional PDF editing software and tools, resulting in huge cost savings in both time and money. Power Macintosh G3 computer equipped with at least a 300Mhz processor, or a Macintosh equipped with an Intel processor. 512 MB installed in the computer. Note: Layout reconstruction varies depending on document and may not be 100% accurate. PDF2Office does not perform Optical Character Recognition. An image in a PDF file is treated as an image. Furthermore, certain types of PDF data are not supported including (but not limited to) transparencies, clipping paths, tilings/shadings, certain graphics operations, graphics filtering, certain text operations and PKCS/AES encrypted documents. Microsoft and the Office logo are trademarks or registered trademarks of Microsoft Corporation in the United States and/or other countries.PDF2Office is a registered trademark of Recosoft Corporation in the United States and/or other countries. All other trademarks are recognized and the property of the respective holder. Copyright © Recosoft Corpotation All Rights Reserved.